"And angels did appear unto men, wise men, and did declare unto them glad tidings of great joy." In his abridgment of the book of Helaman, Mormon declared that “the scriptures began to be fulfilled” when angels started to appear to the people in the ninetieth year of the reign of the judges (Helaman 16:14). In making this statement, one of the scriptures that Mormon may have been referring to is Alma 13:26, in which Alma declared that the coming of Christ “shall be made known unto just and holy men, by the mouth of angels,” just as it had been made known unto their fathers. Nephi wrote that an angel had told him (or his father) that “the God of Israel” would come six hundred years from the time that Lehi left Jerusalem (1 Nephi 19:8). An angel told Nephi’s brother, Jacob, that the Lord God, the Holy One of Israel, would come in the flesh to the Jews at Jerusalem and that they would scourge and crucify Him (2 Nephi 6:9). 2 Nephi 10:3 records a revelation to Jacob in which an angel told him that the One whose coming he was shown would be called “Christ.”2 Similarly, Nephi related that, according to “the angel of God, his name shall be Jesus Christ, the Son of God” (2 Nephi 25:19). King Benjamin, in his great speech to his people, told of how an angel had come to him and declared the “glad tidings of great joy,” of how “the Lord Omnipotent who reigneth, who was, and is from all eternity to all eternity, shall come down from heaven among the children of men” (Mosiah 3:5), and that He would perform great miracles, including the atoning sacrifice and the Resurrection (vv. 3–11). When the coming of the expected Savior was finally near, the Book of Mormon record indicates that the scriptures began to be fulfilled, and angels began (again) to appear to “wise men” (Helaman 16:14).3 One of these chosen men was the prophet and high priest Nephi, son of Nephi, grandson of Helaman, of whom the record states that “so great was his faith on the Lord Jesus Christ that angels did minister unto him daily” (3 Nephi 7:18). On an earlier occasion, Alma had reminded his opponents in Ammonihah of another reason why angels are sent. 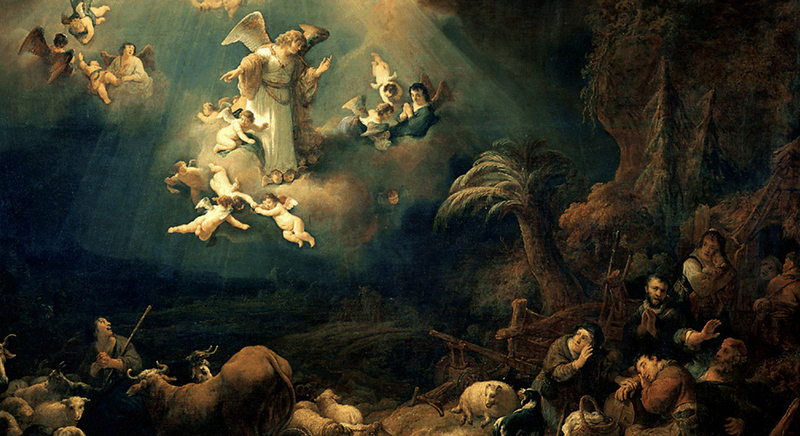 The Lord sends angels to mortals because of their “faith and repentance and their holy works” (Alma 12:30; cf. Alma 11:31). For behold, God … sent angels to minister unto the children of men, to make manifest concerning the coming of Christ … Wherefore, by the ministering of angels, and by every word which proceeded forth out of the mouth of God, men began to exercise faith in Christ; … and thus it was until the coming of Christ (Moroni 7:22, 25). Mormon knew that our merciful Father in Heaven desired that His children have the ability to recognize the signs of the coming of Christ, whether it was in the time of father Lehi, the prophet Samuel, in Mormon’s own time, or in the days leading up to Christ’s Second Coming. Our unchanging God would always send angels to visit worthy individuals who would have the faith, strength, and wisdom (hence “wise men”) to declare the “glad tidings” and fortify the faith of those who have not had the same eye-witness manifestation. Jeffrey R. Holland, “The Ministry of Angels,” Ensign, November 2008, 29–31. 1. Book of Mormon Central, “What Does the Virgin Mary Have to Do with the Tree of Life? (1 Nephi 11:18),” KnoWhy 13 (January 18, 2016). 2. Book of Mormon Central, “Why Does an Angel Reveal the Name of Christ to Jacob? (2 Nephi 10:3),” KnoWhy 36 (February 18, 2016). 3. There is an interesting parallel here with the “wise men” that followed the star to Christ’s birthplace in Matthew 2:1–12. According to some early Christian traditions, the “star” that “went before them, till it came and stood over where the young child was” (Matthew 2:9) was actually an angel (angels are often associated with stars in the literature). See Dale C. Allison, Studies in Matthew: Interpretation Past and Present (Grand Rapids, MI: Baker Academic, 2005), 17–41. 4. See Book of Mormon Central, “How Were the Amlicites and Amalekites Related? (Alma 2:11),” KnoWhy 109 (May 27, 2016). 5. This is an emended rendering of the verse, as found in Royal Skousen, ed., The Book of Mormon: The Earliest Text (New Haven, CT: Yale University Press, 2009), 356.